Centennial Station in High Point saw an amazing wedding reception for Kaitlynn and Joseph full of dancing and the ever revealing shoe game! the wedding itself was held over at the Immaculate Heart of Mary Catholic Church in High Point as well. Centennial Station is also a great location if you are looking for somewhere you can have the wedding and the reception all in one location. Inside there is a wonderful lobby area where you can put a photobooth or maybe a candy table. Inside the main room you have a massive dancing/eating area as well as a fully functional stage where you can have your ceremony or maybe just have your sweetheart table for a little privacy from everyone else! 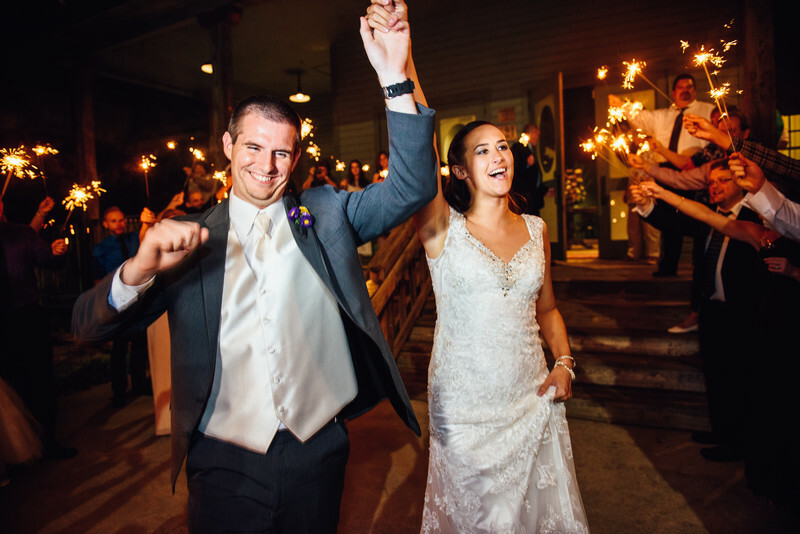 More and more often I get requests for sparkler exit photographs at my weddings and I just loved the way this image came out as they ran off to their getaway car. TIP: If you're going to have a sparker exit make sure you buy long burn wedding sparklers and not use just any old store bought sparkler like they sell for the 4th of July. The reason is that those shorter sparklers have such a short burn time that by the time everyone has gotten theirs lit for your big exit, half of them are already burned out. There's few things more sad than a sparkler exit with only four or five lit. Location: Centennial Station, 121 S Centennial St, High Point, NC 27260. 1/100; f/3.2; ISO 1250; 24.0 mm.